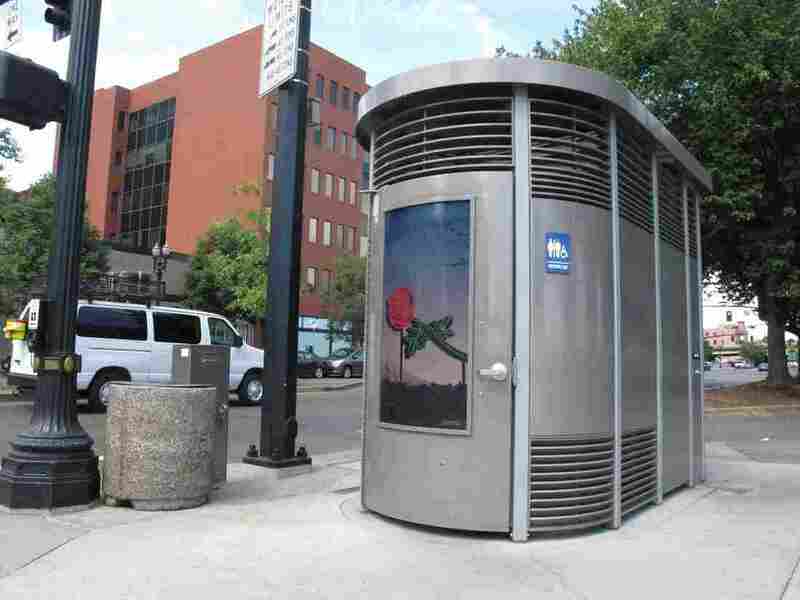 San Diego Installed Public Loos, But Now They're Flush With Problems : Shots - Health News The city installed new public toilets that are better ventilated than port-a-potties and include running water. But they turned out pricier than expected, and plans for more are circling the drain. A Portland Loo in Portland, Ore. San Diego installed two of the public toilets earlier this year, but they cost more than $500,000 to install, and now residents are raising a stink. On a steamy San Diego afternoon, baseball fans are headed toward the Padres' downtown stadium. As they approach the park, they pass a large steel stall on the sidewalk. Darlene Collins stops to look at it. "I did not know that was a bathroom," Collins observes. "I thought it was some kind of electrical equipment or something." Then the stall emits a familiar sound. "Well, now that I hear it flush, ..." she says. "I did not know that was a bathroom." Portland Loos are designed to deter vandalism and misuse. 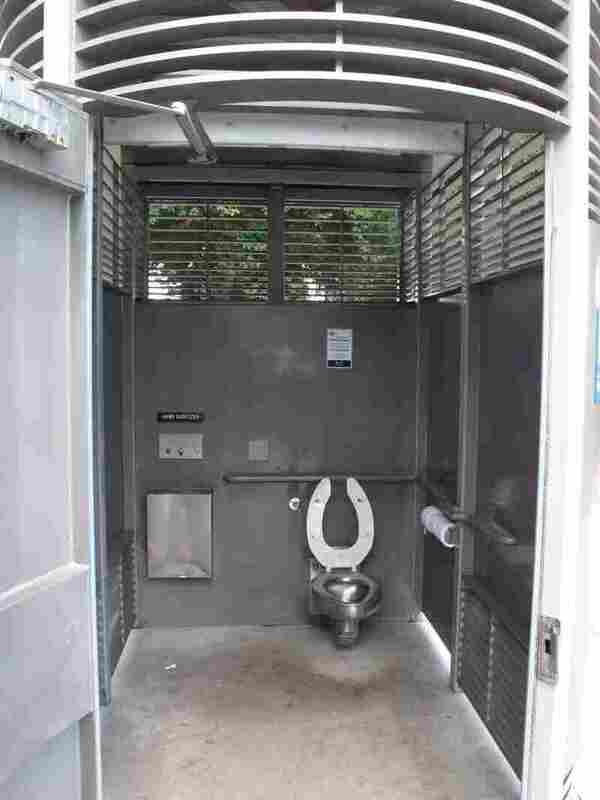 Collins was mystified by a Portland Loo, a prefabricated public restroom that's been popping up from Seattle to Cincinnati to Montreal. The loos have real toilets and running water, and are better ventilated than port-a-potties. But they're controversial. The toilets turned out to be much pricier than expected, and some people complain that they could attract illict activity – prostitution or drug use. Collins isn't keen to try one out. If she had to go, she says, "I would hold it and go in the ballpark." Portland Loos are designed to ease the daunting task of keeping a public restroom safe and clean. They can be power-washed and have slits along the bottom to make it clear if there's somebody inside. They cost about $100,000 each, but that doesn't include the connection to sewer lines, which is where some cities stumble. San Diego spent more than half a million dollars installing its two loos — double the initial price tag. Now, due to more costs and residents' complaints, it's planning to remove one and put it in storage. A nearby homeless shelter will open its bathrooms around the clock instead. Advocates point out that the need to provide clean toilets is a public health problem shared by all cities; solving the problem benefits residents and visitors of all economic levels. Ronald Bennett, homeless for 22 years, says San Diego's push to open more public restrooms has improved his life. "A lot of us don't have a restroom to go to, so we can use that one and it helps," he says. "It gives me a chance to not have to go all the way across town to use the restroom." Not everyone is a loo fan. "The homeless population is up in this area since the Portland Loo was installed," says Jon Wantz, who runs a restaurant a few blocks away from one. "The increased activity, whether it be criminal or drug-related, or just transient-related in general, it's not good for business." "Affording individuals the ability to use a private and safe space to utilize the restroom is basic dignity," counters Heather Pollock, executive director of Girls Think Tank, a San Diego homeless advocacy nonprofit. A restroom isn't truly public, she says, unless everyone can use it — and many people aren't allowed in the restrooms inside stores and restaurants. "If I walked in and was holding all of my belongings, or I hadn't showered in a few days, there's a very high likelihood that I would not be able to utilize that," she says. Pollock points out San Diego provides free dog poop bags from dispensers across the city, but there are only a few places where a homeless person can use a toilet. "I just wonder what kind of message we're sending as a community," she says, "when we're basically saying we value dog owners more than we value human beings and their basic dignity."